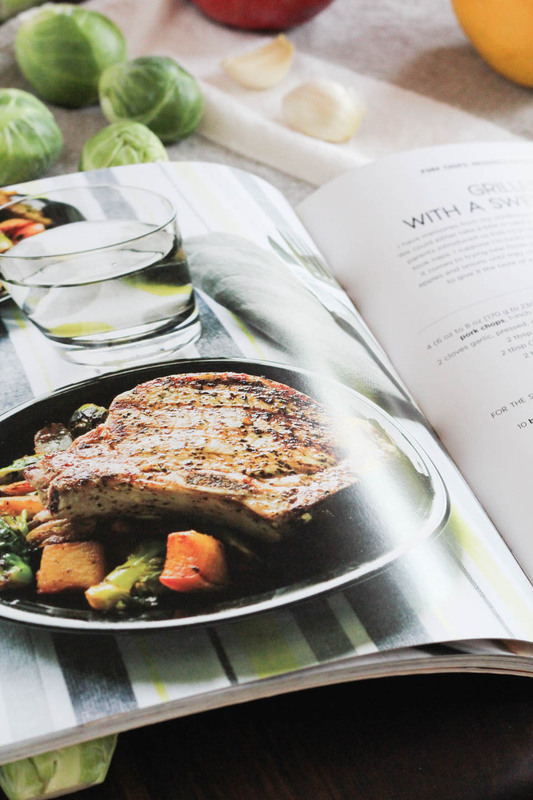 My blogging friend, Shawn Syphus, author of the blog, I Wash you Dry, wrote a cookbook and I am sharing one of her recipe from the book today! 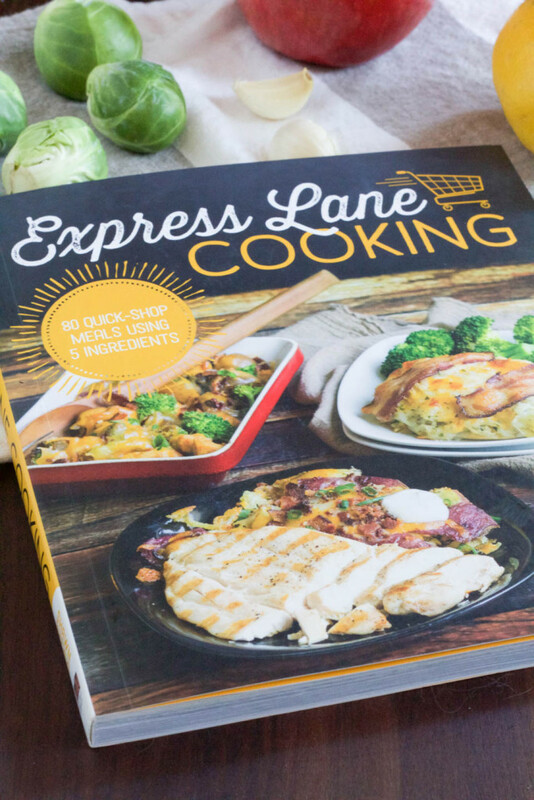 Grilled Pork Chops with a Sweet Pan Roasted Hash from Express Lane Cooking is super tasty, easy to follow and make, and everyone in my family loved it. I am really excited about this book, it’s a different take on making things quick and easy in the kitchen for people on the go, families, or simply because you want to simplify your cooking but want tasty and creative dishes. Basically Shawn takes five ingredients and creates three dishes using those same ingredients in different ways. This makes grocery shopping way easier and faster! It’s creative, easy to follow well written instructions, beautiful photos, and recipes that make you want to go back for more. Basically Shawn makes it easy for you to go to the grocery store and buy a few key ingredients to make dinner all week. Saving you time and money! There are tons of choices too! Chicken, shrimp, pork, vegetarian, and dessert, so anyone can find something they like in this book. 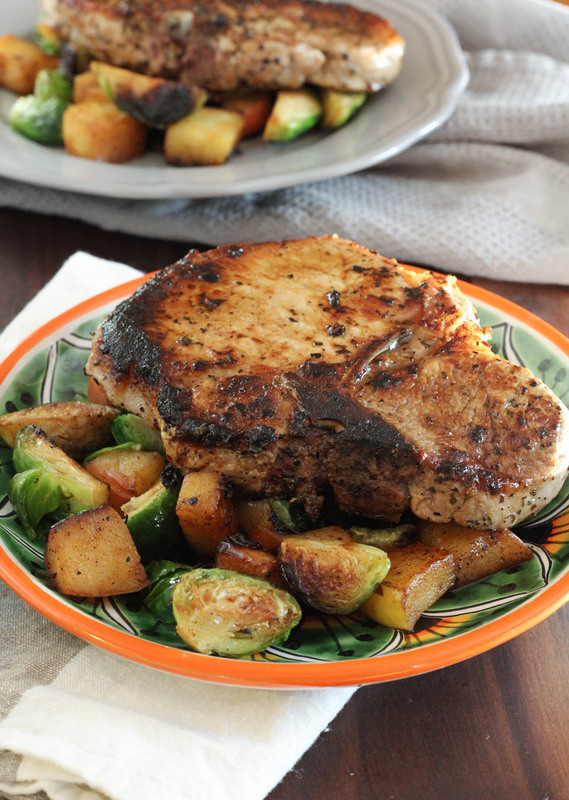 When I made the pork chops, I instantly knew they were going to be loved around the table. The fresh lemon juice, dash of cinnamon, and apples in this dish made it fresh and perfect on the first day it rained here in a long time. For some reason pork and apples make me think cooler weather, adding cinnamon to that and it seals that feeling. It was a lovely dish, great for weeknight meals, but also nice to serve to guests. I am a lover of brussels, so if I went to someones house and they made me this, I’d be stoked! I want to add, I was given this cookbook by Shawn as a gift from one blogger to another. I wanted to share and support this cookbook, but I am in no way being compensated to review or share this cookbook. 1. Place the pork in a shallow dish. Combine the garlic, basil, lemon juice, olive oil, salt, and black pepper in a small bowl and then pour over the pork chops, turning to coat. Let the pork chops sit on the counter for 15 minutes before grilling over medium heat for 7 to 9 minutes. 2. While the pork chops marinate, prepare the Sweet Pan-Roasted Hash by heating the oil in a large, heavy-bottomed skillet-we both love our cast iron skillet for this-over medium heat. Toss in the brussels sprouts, apples and onion and let them cook for 5 to 6 minutes, stirring occasionally until they have charred slightly. Stir in the lemon juice and sprinkle with a couple of dashes of cinnamon. Once the lemon juice has nearly evaporated, add the butter and stir until melted. Remove from the heat and season with salt and pepper to taste. 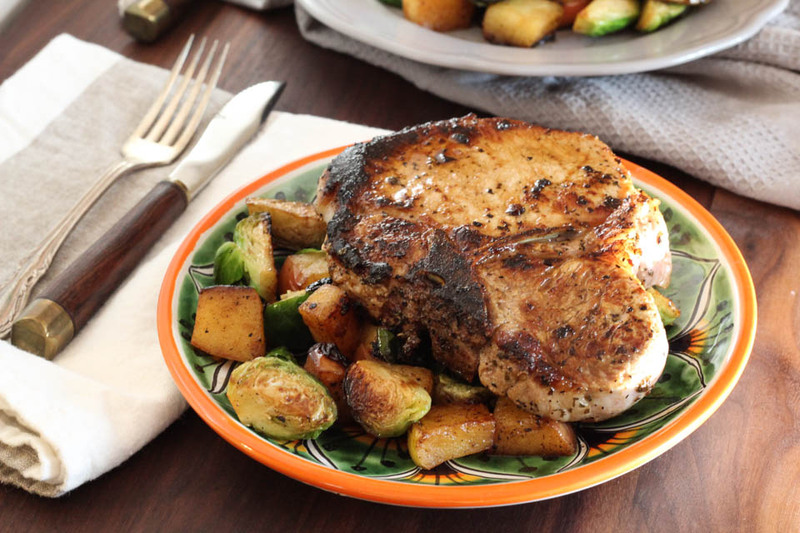 Serve with grilled pork chops on top!